Breathe freely. Don’t hold breath. Move feet and legs before standing. Weight evenly distributed in feet. When shifting weight, slightly bend the weighted knee. When exercising, move slowly, be mindful, work within comfort zone. Gradually explore boundaries of comfort zone. Gradually expand boundaries of comfort zone. Rest when needed. 1. Opening Gesture – Horse riding stance (feet parallel). Stand tall, lengthen arms to front. Avoid locking knees or elbows. Settle into legs while lowering arms. Repeat. 2. Shift and Push – Bow stance (rear foot turned slightly outward, front foot toes forward). Gently push with both palms while settling weight (2/3rds) into front foot. Bring hands in while settling into rear foot. Repeat. 3. Brush and Push (move curtain, throw pie) – Bow stance. Rear hand near shoulder, palm faces forward, ready to push. Forward hand palm down in front of belly. 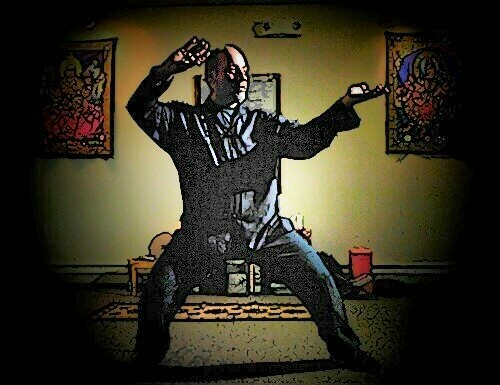 Shift forward, brushing aside with front hand while gently pushing forward with the rear hand. Shift back to starting position. 4. Part Horses Mane (offer gift) – Bow stance. Hold ball (rear hand on top). While shifting 2/3rds of weight onto forward foot, upper hand strokes palm downward, lower hand extends and lifts palm up as if offering a gift. Shift weight back onto rear foot. Hands return to original holding ball position.